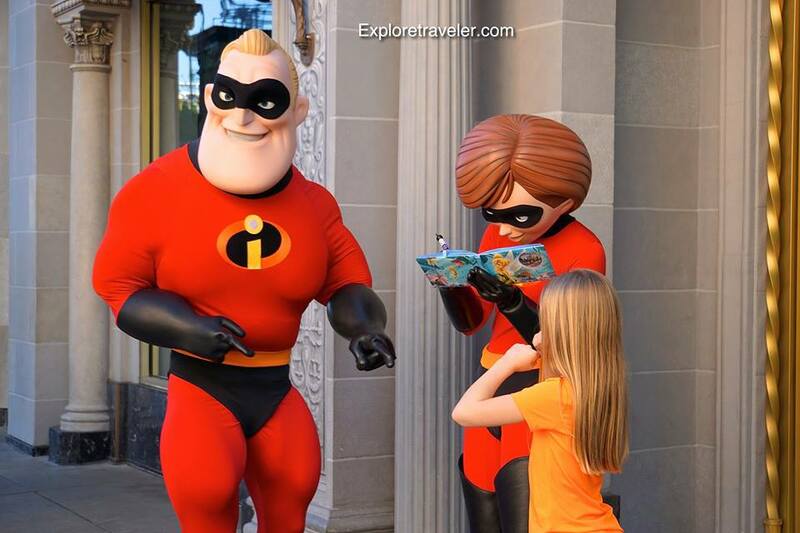 Costumed Characters at Disneyland Resort are everywhere. Where are they? Who are they? Where can I find them? They can be seen as you walk along the park, as they are numerous and mingle with the guests. But there are also special times and places each day where they will appear. Drop by City Hall for a list of costumed characters and the times and locations where you will find them. You can also attain this list at any information booth. Enjoy the many characters and all their costumes. The costumed characters of Disneyland are many, but we will only talk about a few of them When arriving each day, be sure to get a current list at City Hall. Aladdin and Jasmine, two of the Disneyland favorites among the costumed characters can usually be found in Adventureland, near the Bazaar or in front of Aladdin’s Oasis. Aladdin and Jasmine often greet Adventureland guests, sign autographs and pose for pictures in front of Aladdin’s Oasis. Be sure to keep watch for Baloo, as he often can be seen scratching his back on a tree at adventureland. Here Aladdin and Jasmine delight the young children, who adore them. Visit Wonderland to see Alice and White Rabbit chasing through Wonderland. When she grows weary she may be playing games with Mad Hatter and Hook. Then of course she often poses with her friends Tweedledee, Tweedledum, Mad Hatter, White Rabbit and the Queen of Hearts. What fun there is in Wonderland! Are you ready to play musical chairs with Alice, Mad Hatter, and Hook.? They are never too tired to play a good game. Beautiful Belle is very allusive, but can often be found at the Entrance Plaza, strolling down Main Street, or in Fantasyland. But more than anything, Belle loves to read to the sheep near the fountain. How can Belle resist a good book? Be sure to look out for the Big Bad Wolf. He is petty and mean as he huffs and he puffs and he blows someone’s house down. But when he is in a rare good mood, he can be seen smiling and posing with little children. He does’t eat his young guests! Buzz Lightyear is on a mission to protect Sector 4 of the Gamma Quadrant. When he is not busy, he and the Space Rangers pose with young guests and answer their endless questions. When not on patrol, he is usually in front of Tomorrowland Terrace. Buzz never tires of talking to his young guests about tomorrow. So check out the future with Buzz and the boys! Last but not even close to all, is Cinderella. She has no pumpkin coach to ride in, so spends her days on King Arthur’s Carousel in Fantasyland. She is still looking for her glass slipper, but even without her shoes, she is beautiful. She can often be seen posing for pictures on the Hollywood Pictures Backlot. And what does she do at night? She spends much time discussing with her Fairy Godmother how times have changed….that midnight curfew really is outdated, you know! Regardless of which costumed character you love, you will find them at Disneyland San Diego. Costumed characters are fun for all. So drop by city hall and find out where your favorite will be spending the day.